1. Tyres, what else is new? It’s the dreaded ‘T’ word again and one that threatens to overshadow the whole 2013 season with a wide smudgy black mark. After the Mercedes/Pirelli tyre debacle and the subsequent tribunal the optimistic among us could believe it’s all over despite the ongoing grumbles from Red Bull regards the reprimand Mercedes received. 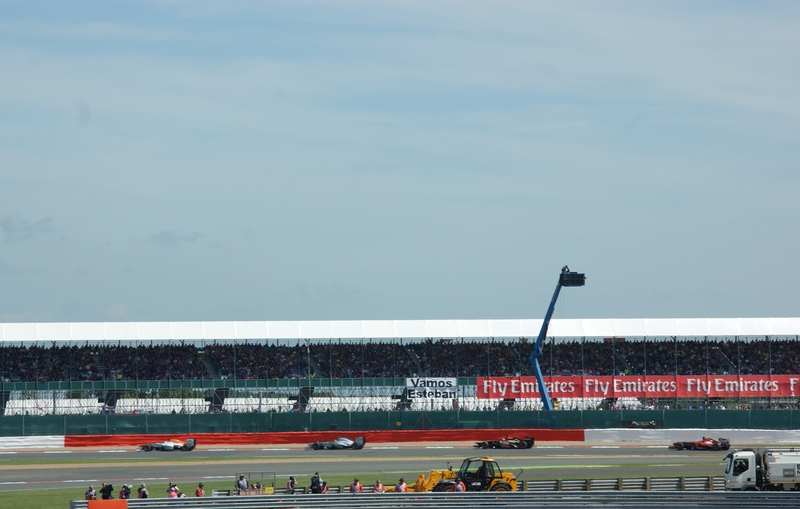 But no, at Silverstone tyres were quite literally thrown all over the track and it all started to disintegrate rather quickly for the home favourite and pole sitter Hamilton. On lap 8 his left rear went after turn 5 and with it thousands of hopes and wishes to see the British driver clinch the top step and the first since joining Mercedes. It would have certainly sweetened the bitter pill he’s had to swallow when watching Rosberg take two wins, and then the third today. Only two laps later and the under-pressure Brazilian Massa had the same tyre go at the previous corner, then to bring the safety car out Vergne’s left rear dramatically departed the wheel rim. Each driver was forced to the back and had to fight to retrieve points at the very least. After a second safety car and with just handful of laps left Perez’s tyre gave up on the Hanger Straight and compounded what was an already tough weekend for the McLaren team, but unlike the previous drivers (apart from Vergne who retired 22 laps after his incident) he was pushed back into the garage with damage to the floor and sidepod. Unfortunately he was running in 6th at the time, but it was a close call for Alonso who was heading for an overtake on the right side and missed the dangerous debris. It is not worth thinking about the consequences of Alonso had been moving left at the time. With Vettel having inherited the lead from Hamilton, and Rosberg just able to hang on it seemed inevitable that the German was going to win. And it should look inevitable, with a clear track out in front Vettel is so utterly dominant it is understandable to want to pack up and leave the rest of the race unwatched, however the gods of Silverstone saw fit to do something about it. Despite it being unsporting, cheers rung out throughout the grandstands when the Red Bull piloted by Vettel slowed to a slow just after the pit entrance. Previously Alonso was adamant that the German’s good luck was going to have to run out at some point, but as the season progressed little of the bad stuff could be seen. But on lap 42 it happened and it could have happened earlier, during a pit stop after the first safety car damage was found on his left rear tyre and the team relayed to their drivers about avoiding the kerbs. 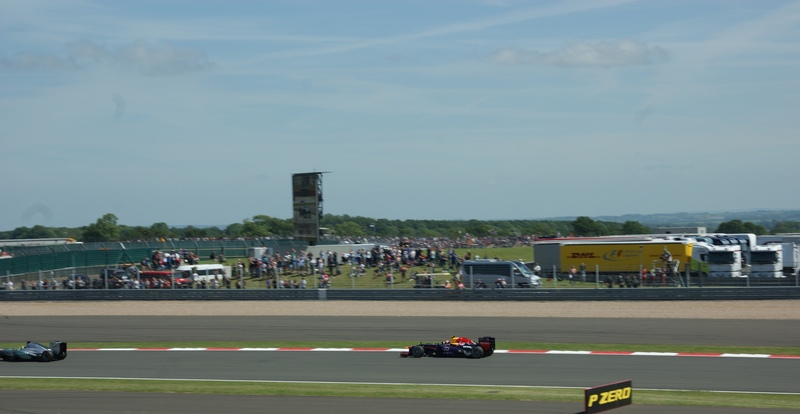 Although for Vettel fans it was a disappointment to see him leave Silverstone empty handed, for anyone wanting a decent fight for the championship it was a perfect result. Just as when Vettel inherited the lead from Hamilton’s misfortune, Rosberg capitalised on Vettel’s. Although it is not to say Rosberg did not deserve the win, his speed and consistency were clear to be seen and although there was profit to be made he had to be there to take it. And with this he had notched up his third win and 100% of the wins Mercedes have earned since their return, something for Hamilton to mull over as he struggles to perfect the feel of his car under braking. There were plenty of those in the race, the best perhaps was split between Webber and Hamilton. The former having a poor start that confused the Australian, something he vocalised over the radio, and contact with Grosjean (50/50 split on fault) catapulted him into 14th. However as we’ve seen on numerous occasions, the most memorable being China 2011, this man can overtake and it’s something he can do well under pressure. So that was exactly what he did, certainly aided by the safety cars a spot on pit stop during the second allowed him to put his foot down and drive on the limit, the aspect of racing he probably loves the most. Hamilton was fuelled by the hope of most of the circuit, judging by the groans heard when his tyre parted company with its purpose, when he dragged himself through the grid from plumb last to a magnificent fourth place. Although it’s not hard to imagine the crushing disappointment he felt seeing his truly stunning pole position wasted. Massa too recovered well after his three wheeled spin, he too clawed his way back into the points and 6th place, a shame considering his start was something to behold. Raikkonen had the delight of being offered an apology from the team after a bad strategy call that saw him unable to challenge for a podium spot he had been in touch with for much of the race. Boullier was quick to say it won’t have an effect on where the Finn parks himself in 2014, as he’s out of contract at the end of the year, but it’s hard to understand that justification. Back to China last year he slipped from 2nd to a groan inducing 14th in nine laps due to a bad call on tyres, however with Vettel scoring nothing it was a prime opportunity to make up some ground on the championship leader. 7. What choo talking ’bout Pirelli? 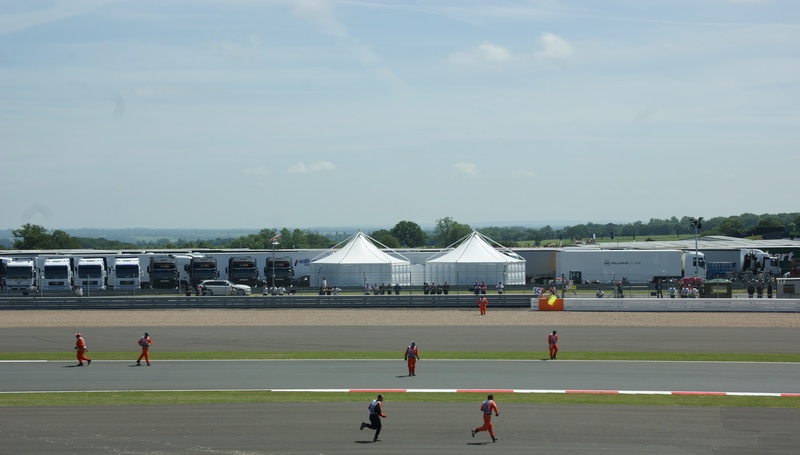 Pirelli sent out a statement after the British Grand Prix, that insinuated the teams were to blame for using their tyre incorrectly by saying, “The 2013 tyres do not compromise safety if used in the correct way.’ Furthering that point they gave a list of the reasons why the teams caused the failures; ‘rear tyres mounted the wrong way around, low tyres pressures (Vettel was informed his tyre pressures had been increased), extreme cambers and high kerbs’. The kerb argument was raised quickly, but as equally quickly was dismissed as there were no such incidents in the support races. The conclusion of this is that Pirelli will be bringing the Kevlar belt rear tyres that were seen in Canada during free practice, and subsequently the young driver’s test slated for Silverstone will be used as a monitored test for the new tyres to be used from Hungary; 2012 structure, 2013 compounds.